This look was part accident and part destiny.. but before I get into all of that.. There are a coupe things I want to share. Last weekend I had the honor of attending the Daily Front Row LA fashion awards with Sunglass Hut. I attended the same awards in New York a couple years ago and I have to say that while both where amazing.. This last one taught me some lessons..
Now you may be wondering what the hec Lady Gaga has to do with any of this? Well I was not only in the same room with this queen and sitting just two rows behind her, but in her speech to honor her long time hair stylist and best friend she dropped so may gems that it was honestly hard to consciously make them stick ..Thank goodness for the good old subconscious in which all the goodness soaked in. Okay now that I have revealed all of that let’s chat about my look, which was part accident and part destiny. Shall we start with the accident portion of the day? That morning I started in Palm Springs, with me just coming off of a weekend of watching pro tennis with the family, straight to getting ready for one of the biggest fashion events in Los Angeles. Three looks not yet tired on waiting for me.. A beautiful suit and two incredible dresses. Sadly none of which worked. Cut to an hour or so before the car was to arrive and a not yet dressed, me and a beautiful floor length pink dress complete with an amazing shoulder bow arrives. It’s perfect.. except the bow is no longer stitched together .. That’s when the panic sets in. You see. I had only decided to attend the day before I was set to leave town for the weekend. I still need to do my hair and make up (yep I generally do my own). SO you see how I was at a total dilemma. …And this is where the destiny comes in.. About 10 years ago in one of my famous raid Grandma’s vintage closet moments, I grabbed a whole lot of stuff. Among that stuff was a shiny black jumpsuit.. And 10 years later last Sunday that jumpsuit started calling my name. Well not actually but you get the idea. So I searched.. and searched.. knocked over a few items.. stood on a chair.. and basically destroyed my office closet and voila! There it was.. my date with destiny. 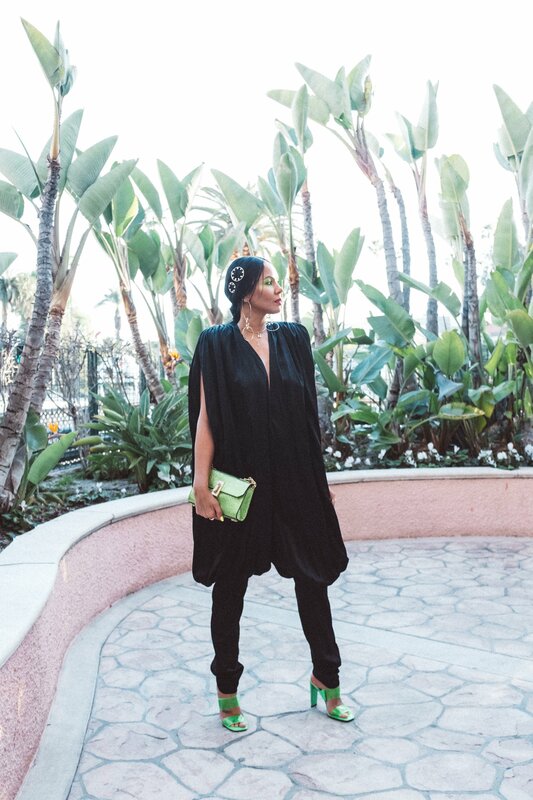 This Super fashiony Vintage Norma Kamali jumpsuit was absolutely perfect for this incredible super fashiony event. Although this jumpsuit is big and dark. I spring(ed) it up with pops of neon green and pink. Both huge trends this season. So there you have it.. lesson’s from Lady Gaga and 30 something year old dates with destiny.. This Norma Kamali is from the year 1979.